After a second season that seemed a little bit askew and hard to follow after only one viewing, with the central character of the first season gone, HBO’s powerful fantasy drama Game of Thrones hits straight out of the gate with an amazing season. It’s a season that sent ripples all over the internet, especially for those who never read George R.R. Martin’s books. It’s the season that gave us the infamous Red Wedding. The King of the North, Robb Stark (Richard Madden) continues his war against the Lannisters and the new king Joffrey (Jack Gleeson), but things aren’t going as good as they once were. His betrayal of his oath of marriage has led to a loss of allies and new enemies. Meanwhile, Jon Snow (Kit Harington) is deeply embedded with the Wildlings north of the wall and has found a new lover there in the fiery redhead Ygritte (Rose Leslie). He has pledged his fealty to the leader of the Wildlings, but has he truly abandoned his oath as a Crow, or is he working to protect them and to save himself to the best of his abilities? Tyrion Lannister (Peter Dinklage) is now demoted and fearful for his life, after being Hand of the King. His former position has now been taken by his towering father, Tywin (Charles Dance), feared patriarch of the Lannister clan. Jaime Lannister (Nikolaj Coster-Waldau) continues to be taken back to his family under the charge of Brienne of Tarth (Gwendoline Christie) at the behest of Lady Stark (Michelle Fairley), but the two run into serious trouble on the way back. It offers an opportunity to reveal a surprisingly more thoughtful and selfless side of Jaime. Daenerys Targaryen (Emilia Clarke) has gathered a large army of freed slaves and her dragons grow larger and stronger everyday. Littlefinger (Aidan Gillen) continues his schemes in the capital, and even tries to scheme his way into stealing the hand of Sansa Stark (Sophie Turner) in marriage. What no one really powerful yet realizes, however, is that, even with Winterfell fallen and Robb Stark faltering, there are still two Stark children in the wind who could pose a serious threat to the Iron Throne, Arya (Maisie Williams) and Bran (Isaac Hempstead Wright). In all, the third season is a powerful and stunning season for Game of Thrones, one that really shifts the balance of the series. The production quality remains high and the interpretation of Martin’s source material remains rather true. The video encodement of the SteelBook remains the same as the previously released Blu-ray. Season Three was shot utilizing the Arri Alexa camera with Cooke S4 and Angenieux Optimo lenses. The AVC 1080p encodement to Blu-ray looks fantastic, and a step above broadcasts of the series. The show has always had a purposely-gritty look that alternated between the bluish grey, desaturated color palette of the North and the warmer earth tones of the South. The grittiness doesn’t harm the image at all, but, in fact, enhances the colder scenes and battle sequences in particular. We get a fine sense of extended contrast, detail and texture in darker areas with little in the way of anomalies to hinder the enjoyment. The audio options are where the big difference is in the SteelBook reissue of Game of Thrones. The previous Blu-ray release came with an English DTS-HD Master Audio 5.1 soundtrack that was admittedly very good, but now the sound has been taken to a whole new level with a Dolby Atmos remix, which will playback in Dolby TrueHD 7.1 on non-Atmos compatible systems. The Atmos mix really shines. Game of Thrones’ sound engineers have always been great at not only the aggressive, discrete sound effects, but the little atmospheric sounds of, say, the crackling fires and clanking swords during scenes at The Wall or the hush of breezes and the din of crowds in Kings’ Landing. These all take on a wider, more spacious and natural sound in Atmos. But, the more aggressive sounds are also a pleasure to hear, such as the screeching of the dragons, which first appear in Episode 1. They downright surround you and swoop right over you. Or, you may find yourself right inside a carriage with Joffrey. It’s magnificent stuff that brings the series to a different level of enjoyment. Housed in a SteelBook with art designed by Elastic, the agency responsible for the series’ Emmy Award-winning opening credits. “The Rains of Castamere” Unveiled (Disc 4) (1.78:1; 1080p/24; 00:46:36) – Get an in-depth look at the creation of the most pivotal episode of Season 3 in this comprehensive exposé featuring cast and crew. An interactive commentary with link-outs to extra video clips and more for the entire “Red Wedding” episode. Roots of Westeros (Disc 5) – Explore the interconnected web of rivalries, relationships and conflicts between the noble houses of Westeros with this interactive guide. Histories & Lore (Disc 5) (1080p/24) – Learn about the mythology of Westeros as told from the varying perspectives of the characters themselves. Inside the Wildlings (Disc 5) (1.78:1; 1080i/60; 00:06:21) – Go beyond the Wall with this introduction to the Wildlings to gain a better understanding of their history and background. The Politics of Marriage (Disc 5) (1.78:1; 1080i/60; 00:08:38) – The concept of matrimony in Westeros is all about making power plays and political alliances. Cast and crew examine this ancient institution and its place in Game of Thrones. 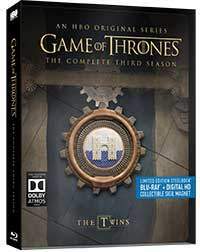 The excellent third season of Game of Thrones is given a whole new level of enjoyment in this new SteelBook edition with the spectacular Dolby Atmos audio mix. Although no new supplements are included outside of the collectible packaging and sigil and the DVDs have been removed, I recommend this set for any fan of the series with an Atmos system. The third season of Game of Thrones recovers from the slight lull of the second for a fantastic story arc filled with intrigue, murder, and treachery. The Atmos mix on this new SteelBook edition only adds to the enjoyment.